The fourth book in the 'Last Mountain Man' series centers on that age old formula - wife gunned down by thugs. As mentioned in the last books, Smoke's reputation as quick draw killer has caught up with him numerous times. Every gunfighter, gambler and adrenaline junkie is gunning for Smoke and wants the gold ticket to Hollywood that comes with a fresh Smoke corpse. A few unwanted guests show up at the Sugarloaf ranch for their shot at American Idol. Unfortunately, Smoke is out selling some cattle and his wife Sally takes the big hit. She is shot three times but the doctors patch her up - they do that in the West with boiling water and rags. Smoke sends her back home to the east after learning she is pregnant with the couple's first child. Smoke finds out that the killers are from a desert Babylon in the southwest. Using a bit of detective work Smoke goes into the barbaric town playing a fool - he dresses like an eccentric artist and takes a beating a few times from some of the town's bullies and outlaws. But dressing like a fool allows him to do a lot of surveillance work. He soon meets up with a US Marshall in the woods, on his sleeping bag, and the two devise a plan to take out the town and free hundreds of prisoners being held against their will. Did I mention prisoners? They are beating brutalized and crucified all over the damn place. Is this 'The Last Ranger' or 'The Last Mountain Man'? 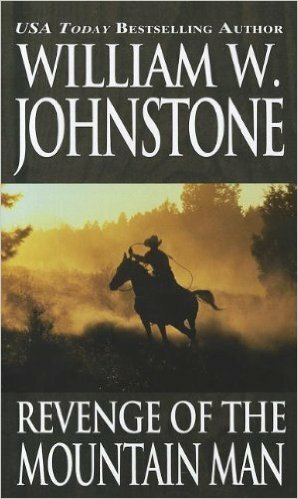 This book has a ton of dynamite and takes a unique Smoke approach by allowing the hero to do some investigative work before using his big 'ole Colt. 44. There are some fist fights, a few gun battles and a lot of anticipation knowing Smoke will turn the tables and fight back - eventually. You can't keep a good man down. The addition of a few allies helped flesh the book out a bit and we get a good look at Sally's wealthy family back home and some of her backstory. Overall, it mirrors events that happened in prior books - Smoke arrives in town, scouts it, attacks everything and then leaves. Plus the amount of bar fights are somewhat predictable. Almost every Johnstone scene in a bar is just an excuse for a gunfight or brawl. Why can't a man just get snozzled in the suds without a bunch of grief? "Revenge of the Mountain Man" is just another good western, take it or leave it.